GlaxoSmithKline's new LEED Platinum certified building. | Photo credit: Francis Dzikowski / Esto for Robert A.M. Stern Architects, LLP This weekend, GlaxoSmithKline, an international pharmaceutical company, is officially moving their Philadelphia office into some fresh digs. Even better the newly-constructed, light-filled, four-story building at the Navy Yard is slated for LEED Platinum certification. The move has allowed GSK to reduce its office space needs by 75 percent through innovative multi-purpose space design that enables employees to surf from workspace to workspace as their activities change throughout the day. Employees are encouraged to work where they’re most comfortable, whether it’s in a space-age looking chair in the atrium, hovering at an adjustable sit-to-stand workstation, or sipping a hot beverage at the café. GSK’s move doesn’t just represent the company’s commitment to Philadelphia, but also reinforces the Navy Yard’s growing reputation as a hub for sustainability, technology and innovation. 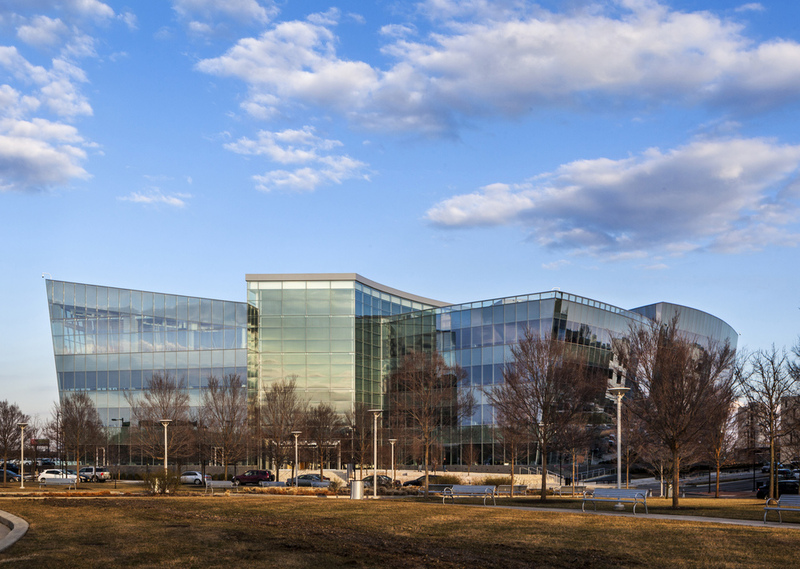 Earlier this year, the Navy Yard hired its 10,000th employee and unveiled its updated master plan, which includes more adaptive reuse of Navy-era buildings, as well as plenty of green infrastructure to support new construction. It’s a plan designed to attract more forward-thinking, tech-savvy and sustainable companies to the Navy Yard, and if GSK’s move is any indication, it’s working. To learn more about the Navy Yard’s sustainability plan, check out our April 2013 article by Alon Abramson.